Analyze That, the sequel to the funny and successful Analyze This (1999) --- the titles certainly display a nice logic --- demonstrates a complicated and comical series of internal connections to both the fictions and the reality of that popular Hollywood subject, the Mafia. While most obviously referring back to its predecessor, the movie also covers, through allusion and parody, practically the whole history of the gangster film, quite literally following the form through generations of mobsters from Little Caesar through The Godfather to The Sopranos. Since a good deal of its humor naturally derives from its dependence on the audience recognizing those allusions and comparing the present work with the several layers of the past, the movie exhibits a relatively high level of maturity and sophistication beneath its comic surface. Analyze That generally follows the pattern of the previous movie, once again joining two very different characters in an odd couple. The mob boss Paul Vitti (Robert De Niro), imprisoned in Sing Sing, finds himself the subject of several assassination attempts, ordered by his rivals in the mob. To escape the situation, he imitates the example of the real-life boss Vincent "The Chin" Gigante and fakes insanity, manifested in his case by a marathon one-man performance of West Side Story. The prison authorities call on Vitti's psychiatrist, Ben Sobel (Billy Crystal), to test his sanity, and ultimately release him to the custody of the reluctant shrink. Much of the humor then grows out of the predictable and familiar contrasts between the tough Italian gangster, who expects to resume his old life, and the gentle Jewish therapist, charged with keeping his patient out of trouble. Vitti fails at a series of orthodox jobs, mostly because of his violent temper, but finally, with the help of his shrink, lands the perfect situation, which also illuminates many of the comic themes of the film. He serves as technical advisor to a television series about the mob; obviously based on The Sopranos, the show is actually named after the great gangster flick Little Caesar, thus neatly linking the earliest and most recent examples of the genre. While assisting the director and cast of the show, Vitti also must cope with competition and danger from two rival mob factions, one led by Cathy Moriarty-Gentile, who a couple of decades ago, when she was young and unhyphenated, starred opposite a heavier De Niro in Raging Bull. Now alas, time, that subtle thief of youth, has much expanded the once lissome Moriarty, while somehow diminishing De Niro; when they share the frame, she appears twice his size and fully capable of knocking out the guy who once played Jake LaMotta. The filmmakers, incidentally, may not have exactly intended that particular comic contrast. In a gesture toward the therapeutic function of the relationship between the mobster and the shrink, the two men manage to help each other conquer some emotional problems. Grieving over the death of his father, for whom he harbored considerable resentment and anger, Sobel finds that probing Vitti's relationship with his own father leads both men to some sort of psychological breakthrough. Fittingly, doctor and patient embrace and weep in the middle of a complicated caper in which the shrink resolves his guilt and pain by beating the hell out of another thug, thus becoming something of a gangster himself. For fans of the first film, many of the same personnel assist in the criminal and comic activities, so a bunch of Italian Americans with nicknames like Joey Boots, Mello, Mo-Mo, Tuna, and Enormous Bobby show up. More important, Paul Vitti's faithful henchman, the huge and ominous Jelly, played by Joe Viterelli, returns, speaking that conventional gangster idiom right out of Guys and Dolls, a curious combination of elaborate formality, comic solecism, and obscene vernacular: Walt Whitman would have appreciated the mixture. Jelly's speech patterns even influence the shrink's large, loutish son Michael (Kyle Sabihy), who aspires to Jelly's job and copies his most dignified locutions. 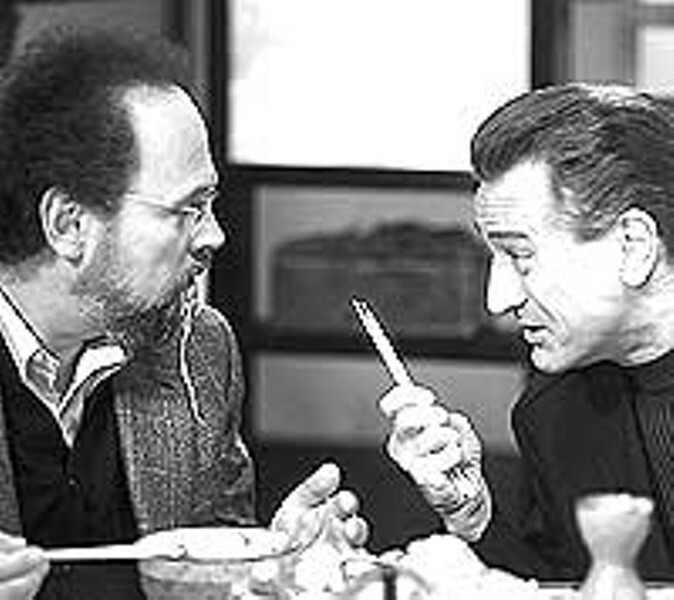 Aside from the pleasingly self-conscious complication of Analyze That, the pairing of De Niro and Crystal accounts for most of the movie's humor. De Niro's wry toughness and Crystal's manic desperation somehow mesh to generate both small and large laughs; even in the midst of some of the more obvious comic situations, both men throw away some casual lines that surpass the easy gags and patent slapstick. Their personalities, their timing, and their interplay provide the fun that propels a surprisingly hip and mature gangster comedy, a kind of humorous guide to the history of the form.